New York City is home to some of the most famous and iconic landmarks, attractions and sights in the whole world, including the Statue of Liberty, the SKYSCAPE museum, the Vessel New York, One World Trade Center, Gulliver’s Gate New York and Times Square. Arguably one of the most famous (and well-loved) things that’s synonymous with the city of New York is the Empire State Building. Often referred to as ‘The Empire State’, New York’s treasured landmark is a sight to behold, both for residents of the city and for tourists. Why Is The Empire State Building So Famous? What Is The Empire State Building Observation Deck? Empire State Building Day Or Night Time? Best Times To Visit The Empire State Building? Construction on the Empire State Building began in 1930 and was finished just over one year later. When it was first completed, it was named as the world’s tallest building, until it was surpassed by the original World Trade Center in 1873. The building has belonged to numerous billionaires over the years and is thought to be worth an estimated $40,948,900 (including the building itself and the land it’s built on). When the World Trade Center was hit in 2001, the Empire State Building reclaimed its title as the tallest building in New York until 2012 when the new One World Trade Center beats it again. The main reason that the Empire State Building is so famous is because it was named after the city’s nickname; The Empire State. It was also the world’s tallest building for 41 years, from its construction, up until the late 1970s. It has also been named as America’s Favourite Architecture, so it’s no surprise that more than 4 million visitors flock to it each year! There are so many fascinating facts about the Empire State Building; here are some of the very best! A B-25 bomber crashed into the building in 1945 during World War 2! President Herbert Hoover officially opened the building in 1931 when he turned all the lights on for the first time with a push of a button, all the way from Washington D.C.! The Empire State Building is used for several things; primarily as office space from the 1st all the way up to the 85th floor! The 86th floor and the 102nd floor are observation decks for visitors to ascend all the way up to, to admire the impressive views over New York City. The very top of the building is home to numerous broadcast antennas that are used by radio and TV networks all over America. There’s also a lightning rod that sits at the very top of the building to prevent damage due to lightning strikes to the rest of the building. There are two observation decks on the Empire State Building; one on the 86th floor and one on the 102nd floor. The 102nd observation deck is a small, circular room that offers some of the very best, panoramic views of New York City and beyond. This floor is also the highest point that the public can access within the building. It’s thought that over 100 million people have visited the 86th floor observation deck during its lifetime and it’s not hard to see why. The 86th floor is much more spacious than the 102nd observation deck and it too offerings 360-degree views of New York, and even offers views all the way over to New Jersey and Pennsylvania! The Empire State Building first lit up in colour in 1976 when it was coated in red, white and blue coloured lights in celebration of the American Bicentennial. The lights are now lit in green and red for the holiday season, and white and yellow during the spring. The building has also been known to change the colour of its lights to celebrate various occasions in America, including the rollout of blue M&Ms in 1995, as well as changing colour to reflect the colours of various New York sports teams. For most of the year, the Empire State is lit up in its signature white colour, unless there is a special occasion as to why it’s lit up differently. The lights come on at approximately sunset everyday and are turned off at 2am every day. 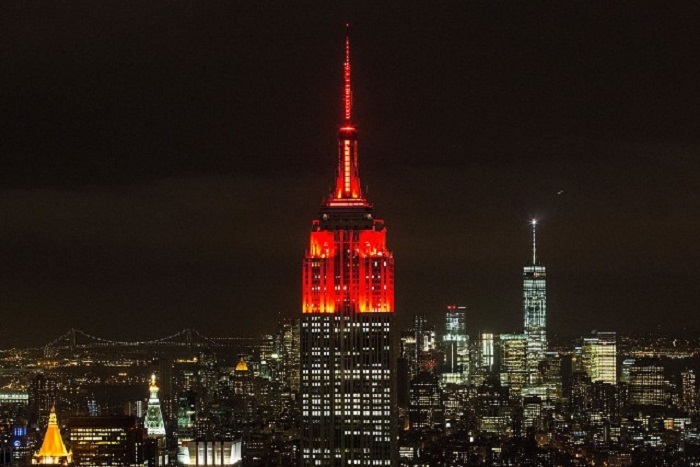 The Empire State Building is open from 8am until 2am, 365 days of the year! This means that you can visit the observation decks at a time that suits you, depending on the type of experience that you want. Many people prefer visiting the Empire State Building during the day as you can see the sights of New York much clearer. However, night time up the Empire State can be just as, if not more so, magical as during the day as you get to experience the entire city lit up spectacularly. There’s not one set time that’s considered to be the best to visit the Empire State Building; it really is all down to personal preference. However, there are three main times of day that are thought to be the best if you want to experience the Empire State in its most magical glory. Arrive early in the morning for the doors opening at 8am for the chance to see the sunrise (only in the winter when the sun rises much later!). You’re likely to beat the crowds by visiting at this time and you’ll get to see the city wake up from above. Mid-afternoon is another popular time to visit the Empire State; particularly during mealtimes when it’s generally less busy. Visiting at this time will show you the city in full swing as you’ll watch the tiny people, buildings and cars below go about their daily business! Sunset/night time are also incredibly popular and incredible times to visit the Empire State. From the observation decks, you’ll get to watch the sun set over the city or visit at night (all the way up until 2am) for a more magical skyline experience when the whole city is lit up. The Empire State Building is incredibly centrally located in Midtown Manhattan and can be accessed by bus, train, subway or foot. Many people will likely be staying in Midtown anywhere, so regardless of where you are, the building should only be a short walk away. If you’re staying further downtown or uptown, then you may want to hop on the bus or the subway and jump off at a nearby station such as Penn Station or 34th Street/Herald Square which takes you practically to the front door. The Empire State Building is 1,454 feet tall (443 metres) and was once the tallest building in the whole world. The Empire State Building was designed by William Lamb who designed the entire thing in less than two weeks! The finish of the building is ‘Art Deco’ style and consists of 85 floors of office space, spanning across an impressive 2,158,000 square feet and housing more than 1000 businesses! With it being the first building to have more than 100 floors, the Empire State truly is an impressive feat to behold. The building also has 73 windows and over 6,000 windows and is the home to many New York based businesses, as well as international enterprises too. Its impressive size means that it can accommodate many businesses and companies who all operate from within its walls. The 86th floor and 102nd floor are used as observation decks for tourists and visitors to the building and offer remarkable views over the New York skyline. 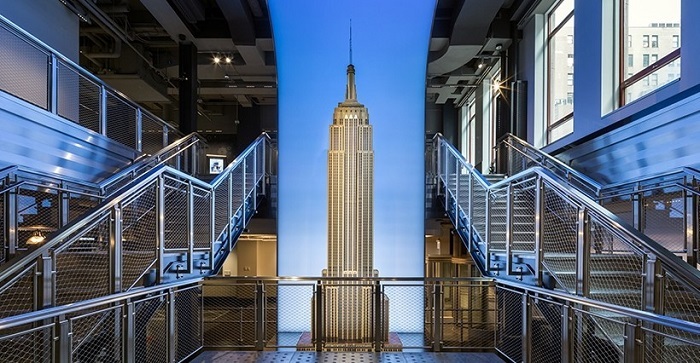 When it comes to planning your visit to the Empire State Building, there are a few things you might want to bear in mind in order to make your visit as enjoyable as possible. One of the best tips to consider when planning a visit to the Empire State is that you should purchase skip-the-line tickets online before you arrive. This is because the queues for entry to the building can get remarkably long, meaning that you waste precious hours queuing when you could instead be exploring other sights in New York. By purchasing your skip-the-line tickets online beforehand, not only will you jump straight to the queue, but you may also find yourself saving money as you won’t have to pay on the day! The best times to visit are early morning when it first opens to skip the queues (8am), mid-afternoon (particularly during mealtimes) and late at night (between midnight and 1.15am when the last elevator ascends to the observation deck). With so many people visiting the Empire State Building every single day, you may find yourself hard pushed to capture an image without being swarmed by the crowds. However, if you visit during quieter times (very early morning or late at night) then you’re more likely to snap the best photos and selfies without any people in them. Thankfully there are no time limits or specific windows when it comes to visiting the Empire State Building so you can stay there as long as you like. Ensure that you give yourself plenty of time once you reach the observation decks, especially if you’re going to be visiting both the 86th floor and 102nd floor (a minimum of one hour is recommended in order to get a good experience). 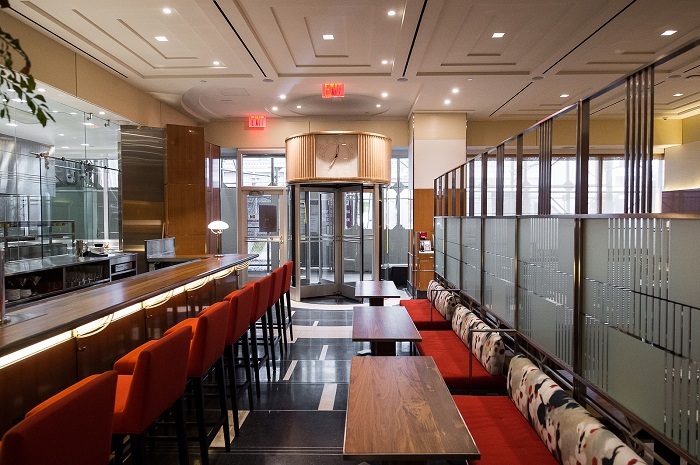 If the Empire State Building wasn’t exciting enough, it’s also home to numerous restaurants, bars and coffee shops including the likes of Starbucks, Juice Press and even a sophisticated Grill and Bar called STATE – take a look at the delicious menu here! 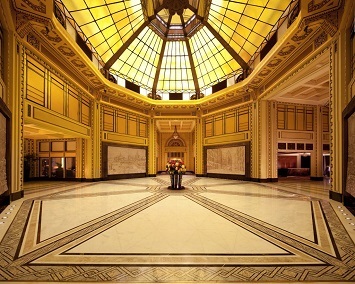 The interior of STATE remains in line with the Art Deco theme of the Empire State Building and is full of elegance and class; the dress code also reflects this theme. The restaurant is open from 7.30am until 10pm, Monday to Friday, 5pm until 10pm Saturday and is closed on Sunday. At STATE, you can also find a great selection of breakfast, lunch, desserts and a bar and lounge menu, as well as the dinner menu that alternates on a daily basis. The Empire State Building is also host to numerous shops including Walgreens, FedEx and AT&T. 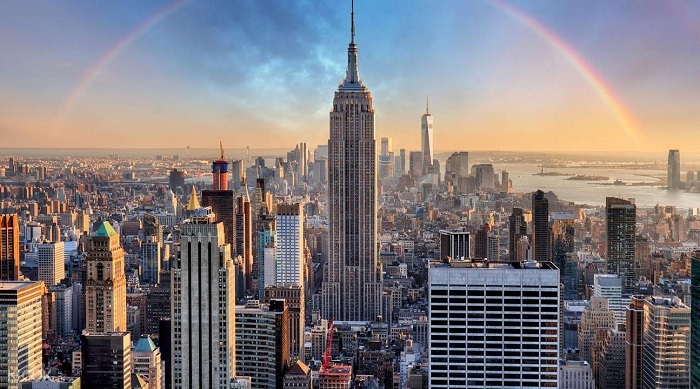 These businesses are some of the mot widely recognised in the whole of New York, and even in America, so the fact that they have a residence inside the Empire State Building really is quite something! Below you can find the top 10 best Empire State Building Tickets and Tours. We choose the best tours based on their affordability, what exactly they offer in the ticket price and customer reviews and ratings. This was excellent particularly on the way down. The ascend to the top was an adventure in itself; the views were then out of this world! See the likes of SoHo, Greenwich Village, Central Park and Ground Zero, plus more! A great way to see multiple sites in New York for a great price! Highly Recommended when visiting New York for the first time! A must have for exploring NY. The Empire State Building resides in Midtown Manhattan, on 5th Avenue and West 34th Street so it really couldn’t be in a more ideal location for getting around the city. Due to its incredibly central location, there are so many other landmarks and attractions located nearby; here are some of the best things to do near the Empire State Building. Make sure to use the New York Tourist Maps in order to get around the city efficiently so you can see as many things as possible! As the Empire State Building technically resides on 5th Avenue, it means that it’s in such close proximity to the shopping wonderland that 5th Avenue has to offer. From the world’s top designer stores, to the likes of convenience stores as well as being the home to the Rockefeller Center and St Patrick’s Cathedral, 5th Avenue is an excellent place to explore while you’re near the Empire State Building. Another incredibly famous New York landmark is the iconic Flatiron Building. Located just 11 blocks downtown from the Empire State, the Flatiron Building is a must-see on any trip to New York. Its iconic shape makes for the best Instagram shots! Bryant Park is just a stone’s throw away from the Empire State and it also offers unique views of the building from inside the park itself. Christmas is the best time to visit Bryant Park when it’s all lit up with festive lights, a huge Christmas tree, a substantial ice-skating rink and dozens of Christmas market stalls. The world-famous Times Square is located just a few blocks uptown of the Empire State Building. Times Square is also one of the most definitive places in New York City and it’s certainly not to be missed. The expansive, brightly-lit billboards can be seen from many blocks away and up close and personal is when you get the true feeling of being a New Yorker. One of the largest, and most famous train stations in the world, Grand Central Terminal is only 7 blocks from the Empire State Building. Even if you’re not planning to catch a train from Grand Central, it’s still a place that you should visit while in New York, especially if you’re visiting the Empire State Building. The Empire State Building is one of the things that makes New York City so famous and iconic. Its towering structure on the Manhattan skyline boasts plentiful views of the city from the two observation decks. While it might not be one of the free attractions in New York, it is one of the best and definitely worth every penny that you pay for tickets. One of the best ways to get around the city, and to pay a visit to the Empire State Building is to purchase the Hop on Hop Off New York bus ticket which will take you on a tour all over the city. While in New York, make sure you make the most out of all the best New York Attractions Tickets; ensuring that the Empire State Building is at the top of your must-see list. The New York Pass is also a great thing to buy when visiting the city as it will allow you to visit as many attractions as you’d like.